Establishing a representative office in Vietnam is considered a safe initial step before traders conduct a series of complex high-cost legal procedures to establish a wholly foreign-owned enterprise. For any new foreign trader entering Vietnam’s market for the first time, their initial primary purpose might be promoting the brand, getting acquainted with and examining the market while preparing for official business. Therefore, many people establish a representative office as an initial step. Having operated for at least one year from the date of establishment or registration, the remaining operation term must be at least one year from the date of submission of the application for a Certificate of Establishment of a Representative Office. The time to be granted a Certificate of Establishment of a Representative Office is quite fast. A representative office can be licensed to operate within about seven working days of a sufficient and valid dossier being submitted to the licensing agency. The establishment of a wholly foreign-owned enterprise in Vietnam requires many stages with numerous procedures and documentation. The process can cost up to several thousand US dollars. Spending such a large initial investment without a clear comprehension of Vietnam’s market is an insecure and risky move. 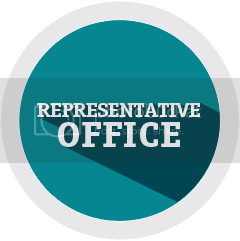 Another benefit of establishing a representative office is that it will not be subject to taxes due from business activities, but will only have to pay personal income tax for office staff. Although a representative office for a foreign company is not allowed to perform business operations or other profitable activities as prescribed by the law, it can still perform the functions of liaison office, market research and promotion of business investment opportunities, etc. for foreign traders in Vietnam. Once the image and brand of a foreign trader has become familiar and popular with clients in the Vietnamese market, they can be more assured to establish a wholly foreign-owned enterprise and officially perform commercial activities in Vietnam.